A team of professionals from Collingwood Neighbourhood House (CNH), Renfrew Park Community Centre (RC), Windermere Family of Schools, University of British Columbia (UBC) and JW Sporta developed the evidence based Intercultural Physical Activity Guide, which aims to increase intercultural understanding using physical activity as a tool. 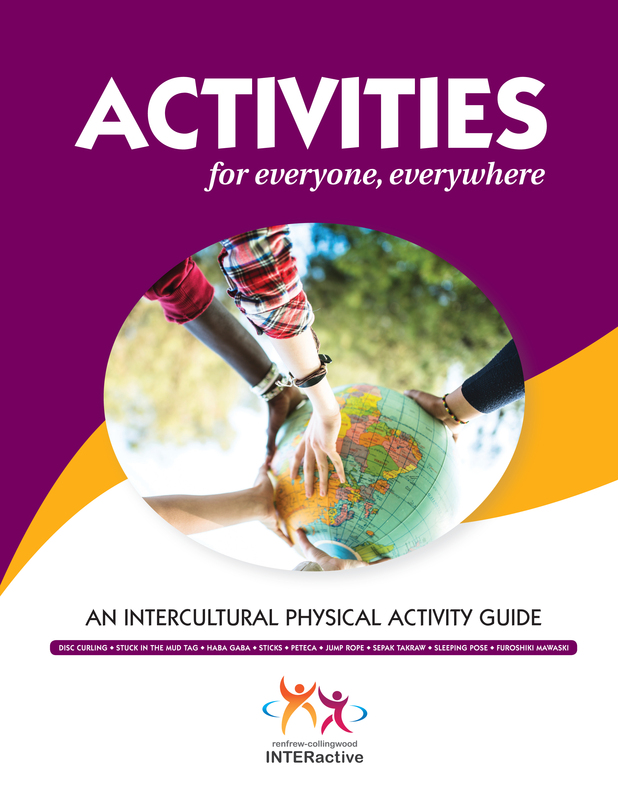 The Intercultural Physical Activity Guide is a launching pad for any group to explore interculturalism or physical activity. It's geared toward individuals in leadership capacities, but the activities, though originally planned for school-aged children, can be enjoyed by anyone regardless of age. The Guide includes over seven categories of activities ranging from handball to skipping and jumping, and within each category are cultural variations of activities. In Target and Accuracy Games, for instance, there are games from Sierra Leone, First Nations groups (Sahtu and Chipewyan), Greece and Ethiopia. There's even a category teaching readers how they or their participants can create their own activities. Each category has a series of intercultural discussion questions, activity co-creating suggestions and physical activity outcomes. 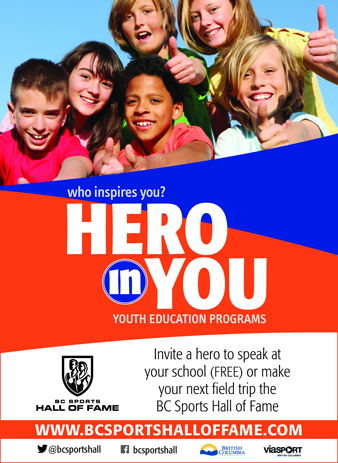 The BC Sports Hall of Fame offers a wide variety of field trips for both schools and community groups. Ideal for Grades 4 through 10, their field trips combine guided and self-guided tours plus interactive exploration in a dynamic venue for both students and educators. Curriculum based lesson plans are available online. JW Sporta designed and helped create teacher friendly tools to market to teachers in BC. How far Terry Fox ran each day during his Marathon of Hope? Who the first Canadian woman to win Olympic gold at home was? 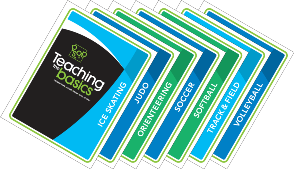 This set of 75 cards will test sporting knowledge and players will be inspired by world class athletes, coaches, officials, media personalities from British Columbia. The questions are gender balanced and have strong aboriginal representation. This thought provoking curriculum-based card game, designed for ages 8 to 15, was created by the BC Sports Hall of Fame in collaboration with JW Sporta to celebrate and share top moments and champions in BC's sporting history. The categories include: Did you know? Challenging your science and social humanities; Mind Matters Testing your sporting calculations and language skills; Fun Fact Tapping into your creative brain; Can you? Actively demonstrating your answers. Contracted by the Government of British Columbia (1979-2015) to create, design, deliver and service a sport skill development resource package to help teachers, coaches and instructors teach and assess children and youth their basic sport skills. More than one million children have received skill level crests for their participation in the Program. 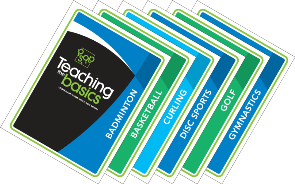 Thousands of teachers and instructors are equipped to teach children their basic sport skills every year. Hundreds of teachers and student teachers each year participate in educational and active workshops about the Program, the benefits of physical activity, and how to increase the physical activity levels of girls and young women. The Program is unique to BC and is a recommended learning resource for physical education curricula across Canada. The delivery and distribution system established is renowned within the Physical Education field. Designed, managed the production & layout, and printing processes for this comprehensive teacher resource guide annually since 2002. Action Pages! is a listing of hundreds of daily physical activity, physical education, and healthy eating resources from across Canada including published and online resources, in-services and presentations, and support organizations. The resource is arranged by curriculum organizers associated with the PE IRP; resources supporting the Ministry of Education's DPA mandate are indicated with an icon. There is no resource like the Action Pages! produced elsewhere in Canada. Designed, pilot tested, and implemented Action Schools! BC, a best practices whole school model designed to assist elementary and middle schools in creating individualized action plans to promote healthy living while achieving academic outcomes and supporting comprehensive school health. The initiative is a source for practical and relevent professional development; curriculum-linked resources and support for teachers in physical education, physical activity and healthy eating; and physical activity and healthy eating leadership training and resources for students. 2002 - 2003 - Developed school-wide planning framework composed of six Action Zones. 2003 - 2004 - Pilot tested and supported a comprehensive evidenced-based healthy outcome evaluation. 2004 - 2006 - Designed, pilot tested and implemented school-wide and grade-specific K to 7 and Middle School Physical Activity components. 2004 - 2015 - Implemented provincial roll-out and support of Physical Activity component to Grades K to 7 and Middle Schools. 2006 - 2015 - Developed and implemented the provincial roll-out of Physical Activity Student Leadership Sessions. 2007 - 2015 - Implemented the provincial roll-out and support of Healthy Eating component for Grades K to 7. Developed and implemented the provincial roll-out of Physical Activity Tri-Mentor Student Leadership Sessions for Grades 9 to 12. 2011 - 2015 - Developed, piloted, and implemented the provincial roll-out of a Healthy Eating Student Leadership Session. A national initiative to increase opportunities for inactive girls and young women (ages 9-18) to participate in physical activity and sport coordinated by the Canadian Association for the Advancement of Women and Sport and Physical Activity (CAAWS). On the Move workshops are delivered across the country and advocate for female-only, participant-driven, conmunity-specific programs, and challenges traditional models of service delivery. The On the Move Handbook was fully revised and updated in 2006, and continues to provide a practical "why" and "how to" resource. The On the Move concept underpins CAAWS' work to increase opportunities for Aboriginal girls and young women through Team Spirit: Aboriginal Girls in Sport. The Newcomer On the Move project is designed to address disparities in the availability and utilization of physical activity and sport opportunities for newcomer girls and young women. In 2012, produced Movers & Shakers for Physical Education BC. 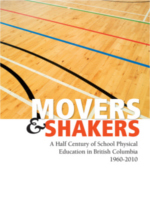 Movers & Shakers is a collection of essays by people in the field of physical education who have been intimately involved in the development of this part of the school curriculum in British Columbia for over a half century. For more information please visit BCTF. SportFitâï¿½¢ is a complete resource that educators may tailor to meet learning outcomes related to health, physical activity and other subjects. SportFit, a free, easy-to-use interactive program that encourages children and youth to discover sports. The Challenge is made up of eight activity stations measuring physical abilities. Then, students take a short survey about their personal preferences. SportFit then tabulates the sports that may suit them and generates a personalized certificate listing the top three summer and winter sports they would be good at, based on their physical capabilities and personal preferences. Then students may explore these sports - from lessons to historical moments to finding their local clubs and associations - using SportFit's extensive sport resources. Pilot tested with more than 1500 students in 12 school districts (rural and urban) across British Columbia. Produced SportFitâï¿½¢ Implementation Guide for teachers. Edited and vetted SportFitâï¿½¢ website and streaming videos. Was officially launched on April 25th, 2003. Currently available to teachers and community members across British Columbia and Canada. In 2014, managed the production and layout for the Special Olympics BC Healthy Living for Families Booklet to support Special Olympics athletes, coaches and families. This resource is a source of healthy eating and hydration information and tips to encourage the consumption of healthy food to fuel the performance of Special Olympics athletes. BC Wheelchair Sports is a not-for-profit organization devoted to providing opportunities for athletes with physical disabilities. Managed the production of and the layout and printing processes for the Bridging the Gap resource. This resource provides communities across Canada with some basic guidelines for the development and implementation of wheelchair sport programs and recruitment initiatives. The manual contains information on wheelchair sports, how to run introductory sessions, how to get an ongoing program set-up as well as general information on disability and contact information for related services. In 2000, managed the production of and the layout and printing processes for the Wheelchair Sports Teaching Resource. This resource assists teachers to educate upper intermediate grade students about wheelchair sports for persons with a disability. It continues to be included in the Action Schools! BC Resource Boxes for Grades 4 to 7. In 2010, managed the production of a Wheelchair Rugby Schools Program manual for teachers. This resource alongside the Wheelchair Rugby Demo Workshop sets out to educate teachers and students about the sport and its athletes before seeing a game as well as helps raise awareness of accessibility and equality issues and encourages both able-bodied and people with disabilities to be physically active. 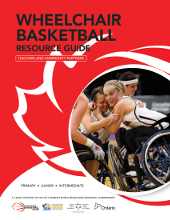 In 2014, managed the production and layout of a Wheelchair Basketball Resource Guide for schools and community partners. This resource sets out to educate students of all abilities about wheelchair basketball, accessibility issues, and disability sport. This resource encourages people with and without a disability to be physically active. 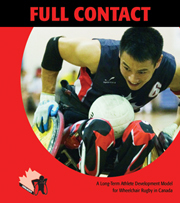 In 2010, managed the production of and the layout and printing processes for the Full Contact: A Long Term Athlete Development Model for Wheelchair Rugby in Canada. The model addresses athlete recruitment, development and training, within a seamless sport system. It also addresses the recruitment and training of coaches, officials, classifiers, volunteers and the many specialists essential to a successful model. From 1994-2001, contracted by the Insurance Corporation of BC to deliver and service a provincial safe cycling initiative designed to help teachers and instructors teach safe cycling skills to children aged 7 to 13. For five years, teachers in every elementary school in British Columbia received safe cycling information and access to program resources and participant incentives. Over 100 teachers were certified to teach On-Road Safety. Over 26,000 student participants successfully completed the Bike Smarts Program. From 2002-2004, developed and produced the first of its kind in North America, a three level certification program comprised of workbooks, course conductor guides, and powerpoint slide presentations. in 2000, developed and delivered a thought-provoking SporTrivia card game for intermediate grades in collaboration with the BC Games Society. From 1995-2003, developed and delivered the More Than An Open Door Leader's Presentation Resource designed to help leaders improve the situation for girls and women in physical recreation. From 1996-2003, produced a workbook and workshop presentation binder for community recreation and health practitioners to enhance recreation opportunities for women living in poverty. From 1996-1997, designed and developed "Organizing for Results" resource materials for the national Skills Program for Management Volunteers and developed a national strategic plan for the National Council of Federal and Provincial/Territorial representatives for the future direction of the Program. From 1990-1993, produced and distributed the BC Physical Education Society's journal to inform physical educators and administrators about physical education developments and initiatives in BC.